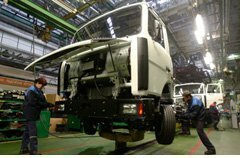 AutoVaz, Gaz and KAMAZ is negotiating with Iran about the organization of the assembly of Russian cars in Iran. However, specific agreements have not yet achieved. Russian automakers, with the crisis on the Russian market, in the beginning of the year reported that they intend to offset losses from lower sales in the domestic market through the exports. Automakers have planned doubling of deliveries abroad, and focused on their traditional markets in the CIS, as well as developing countries in Asia, Africa and Latin America. AutoVAZ exports cars mainly in Kazakhstan, Azerbaijan and Ukraine, small amounts are sent to Europe, the Middle East and Latin America. The company did not rule out the launch of SKD cars Lada Granta in Egypt, and in 2016 plans to start production in Kazakhstan. The company did not rule out the launch of SKD cars Lada Granta in Egypt, and in 2016 plans to start production in Kazakhstan.